RecurDyn RFlex (Reduced Flex) gives you fast simulations with flexible bodies in your multibody dynamics system. RecurDyn RFlex represents flexible bodies using modal information that is output from Finite Element Analysis (FEM software). RecurDyn RFlex also includes options to export body loads to FEA and to export modal participation factors. The RecurDyn RFlex technology is based on the modal reduction theory of Craig Bampton. The RecurDyn/RFlex toolkit allows RecurDyn to include mode-based Reduced Flex (RFlex) flexible bodies in RecurDyn models. RFlex bodies are a very low-computational-cost method for including flexibility in a model. RFlex bodies represent the deformation of the body using component mode synthesis (CMS), in which the deformation of the body is represented by a linear combination of vibration mode shapes and static correction modes. RecurDyn/RFlex is useful for modeling flexible bodies in which the total deformation is small and can be well-represented by vibration modes, but in which the body can experience arbitrarily large translation and rotation. Because the user manually chooses which modes to use to represent the deformation of the body, the number of degrees of freedom of an RFlex body can be very small, and yet represent deformation very accurately. Stress and strain analysis can be performed on RFlex bodies. The stresses, strains, and displacements can be graphed or displayed in contour plots. Fatigue analysis can also be performed on the results directly in RecurDyn using the RecurDyn/Durability toolkit (a separate purchase is required), or the output can be exported for fatigue analysis in FEMFAT. Efficiently include flexible components within your RecurDyn full-system model. 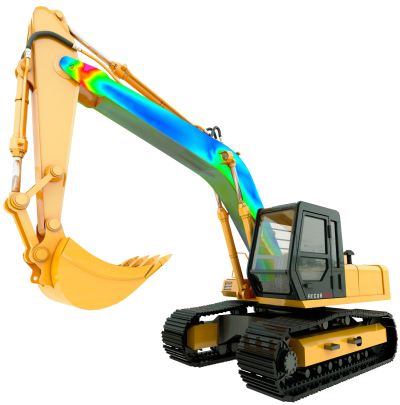 Investigate effects due to the flexibility in the system, including enhanced vibration analysis. Calculate more accurate loads in systems with path-dependent structures, for use in fracture or fatigue calculations. Reduces errors identified during the simulation. These additional modes can overcome the limitations of the modal approach. Saves data in a neutral file that can be archived and reused.